Ten years ago, at the IEEE Engineering in Medicine and Biology Society Annual Conference in New York City, I presented a paper titled “How to Explain Why Unequal Anisotropy Ratios is Important Using Pictures but No Mathematics.” Although it was only a four-page conference proceeding, it remains one of my favorite papers. The bidomain model describes the electrical properties of cardiac tissue. The term “bidomain” arises because the model accounts for two (“bi”) spaces (“domains”): intracellular and extracellular. Both spaces are anisotropic; the electrical conductivity depends on the direction relative to the myocardial fibers. Moreover, the intracellular space is more anisotropic than the extracellular space, a condition referred to in the literature as “unequal anisotropy ratios.” This condition has important consequences for the electrical behavior of the heart. Many papers describe the implications of unequal anisotropy ratios. The mathematical derivations and numerical calculations in these reports emphasize the consequences of unequal anisotropy ratios, but they often fail to explain physically why these consequences occur. For example, Sepulveda et al. discovered that during unipolar stimulation, depolarization occurs under the cathode but hyperpolarization exists adjacent to it along the fiber direction. 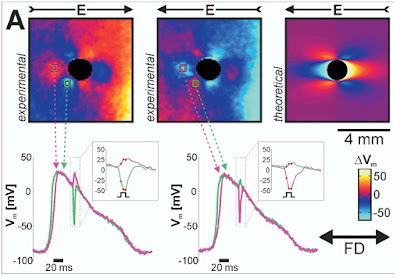 The hyperpolarized regions affect the mechanism of excitation, the shape of the strength-interval curve, and the induction of reentry. Yet, when I am asked why the hyperpolarization appears, I find it difficult to give an intuitive, nonmathematical answer. In this paper, I try to answer the “why” questions that arise from the bidomain model. I present no new results, but many old results are clarified. 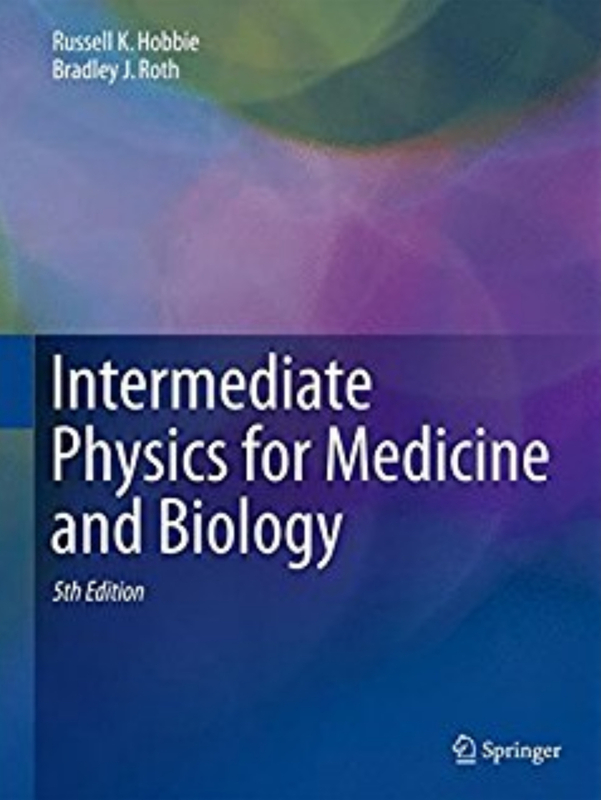 My hope is that the reader will develop the intuition necessary to understand qualitatively how cardiac tissue behaves, without having to resort to lengthy mathematical derivations or numerical calculations. Parts of this article have worked their way into Intermediate Physics for Medicine and Biology. For instance, the article explains how a wave front propagating through cardiac tissue creates a magnetic field. This analysis is reproduced as Problem 19 in Chapter 8 on biomagnetism. Problem 50 in Chapter 7 examines the transmembrane potential induced in cardiac tissue when an electric shock is applied in the presence of an insulating obstacle. I love how this example highlights the importance of unequal anisotropy ratios. Consider an insulating cylinder in an otherwise uniform tissue with straight fibers (Fig. 7). 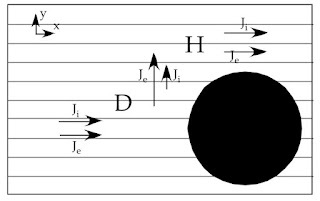 An electric field is applied from left to right. Far from the insulator, the current is in the x-direction and is distributed equally between the intracellular and extracellular spaces. As current approaches the insulator, it turns left to circle around the obstacle. The current then is flowing approximately perpendicular to the fibers, so most of the current will be extracellular. As the current turns right to flow once again in the x-direction, it will be parallel to the fibers and will again be distributed more or less equally between the two spaces. As current leaves and then reenters the intracellular space, it causes depolarization and then hyperpolarization. The transmembrane potential distribution surrounding the insulator is even in y and odd in x. The result is the complex pattern of polarization surrounding an insulator in cardiac tissue during electrical stimulation. Fig. 7. Distribution: Polarization caused by an insulating obstacle. This figure explains the results observed in . The role of theoretical analysis in biology and medicine is to make predictions that can be tested experimentally. 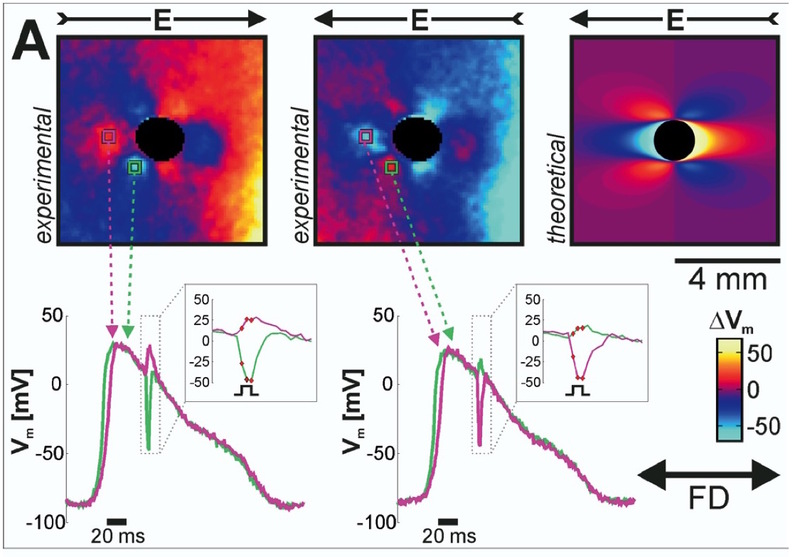 My former PhD advisor John Wikswo and his team used optical mapping to measure the transmembrane potential around an obstacle during a shock. Their results are shown in the picture below. The bottom line: the prediction and the experiment are consistent. Physics works! from: Woods et al. (Heart Rhythm, 3:751-752, 2006). One graduate student, Marcella Woods, was involved in both of the projects I mentioned. She performed the theoretical analysis of the magnetic field produced by wave fronts in cardiac muscle under my direction when I was on the faculty of Vanderbilt University. After I left, she worked with Wikswo and carried out the experiments shown above.